As many of us graduate from our current phone to a Galaxy S8 or S8+, I will once again suggest you consider buying one of the cheap magnetic air vent car mounts you’ll find on Amazon. These little guys only cost a few bucks, yet they allow you to mount your phone without a ridiculous dashboard vise grip kit. All you have to do is slap one of these in an air vent and then attach your Galaxy S8 (or other phone) on the thing and it’ll stick. What are they? These magnetic air vent mounts typically work by you placing the mount in a car air vent and then attaching an included metal sticker plate to your phone to allow for your phone to magnetically attach to the mount. They are super convenient, but I love them with select Samsung phones because you don’t even need the metal sticker in some situations. 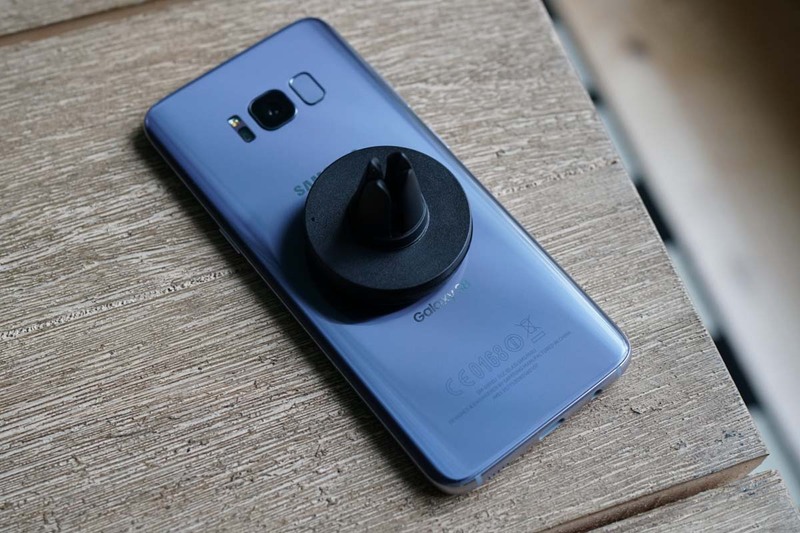 Galaxy S8 and Galaxy S7: My understanding is that because of the wireless charging in Samsung phones, the coil inside allows these phones to stick to these air vent mounts without any extra metal stickers. Your mileage may very, but my wife and I used Spigen’s Kuel A200 for months and months with naked Galaxy S7s and had no issues. They work great with the Galaxy S8 so far too. I have not tested the S8+ with these. LG G6 too: I’ve found that the LG G6 is held nicely as well without stickers, more than likely because of the wireless charging it features too. With a case: If you are using a case, then you’ll need to use the sticker, but that’s no bigger since you can hide the sticker within a case and get that nice magnetic grip. Galaxy S6 and Note 5: In last year’s similar post, I brought up the Galaxy S6 and Note 5 as being naked compatible and assumed they would work well, but a number of people reported back that they didn’t. There are dozens of options out there and they can be had for only a few bucks. I’ve got a link to the Spigen Kuel A200 below (just $7.99), since those are what I have in my cars. But again, there are plenty of companies making these things that might be cheaper.